SalesforceIQ offers several out-of-the-box integrations for marketing and support automation. These integrations let you get new marketing prospects into your sales team's hands with no manual effort or provide a comprehensive view of your company's communication with your Accounts and Contacts. Learn more about direct integrations and other integration types by watching this live training. Connecting SalesforceIQ to HubSpot takes just minutes. 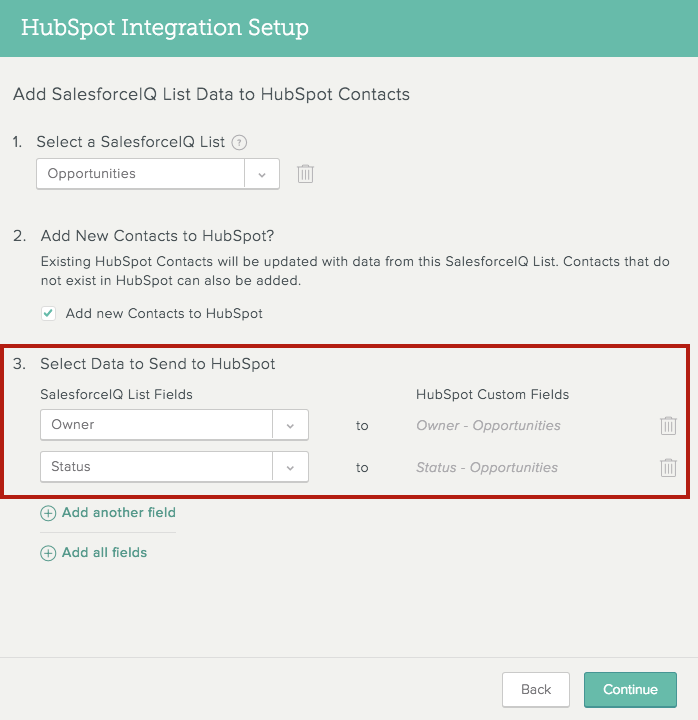 You can either add Contacts from HubSpot into SalesforceIQ, pull information from SalesforceIQ into HubSpot, or do both! This connection lets you get new marketing leads into your sales team's hands with no manual effort. By pulling HubSpot information into your SalesforceIQ List, you'll arm your sales teams to qualify leads faster and smarter than ever before. 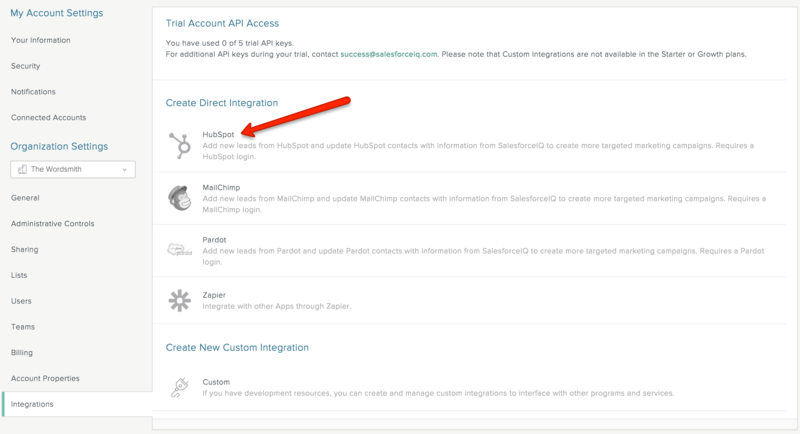 Under Create Direct Integration, click HubSpot. 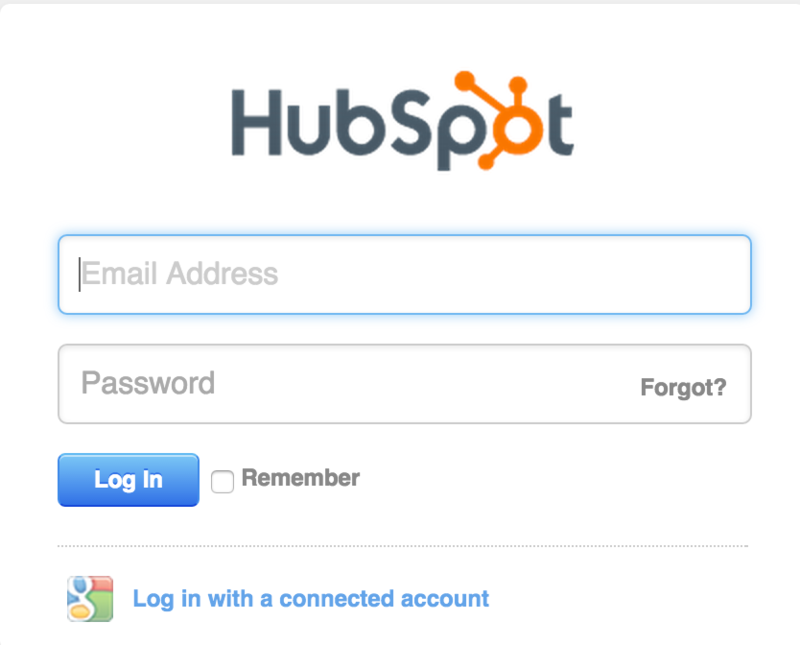 Enter your HubSpot login information and click Log In. 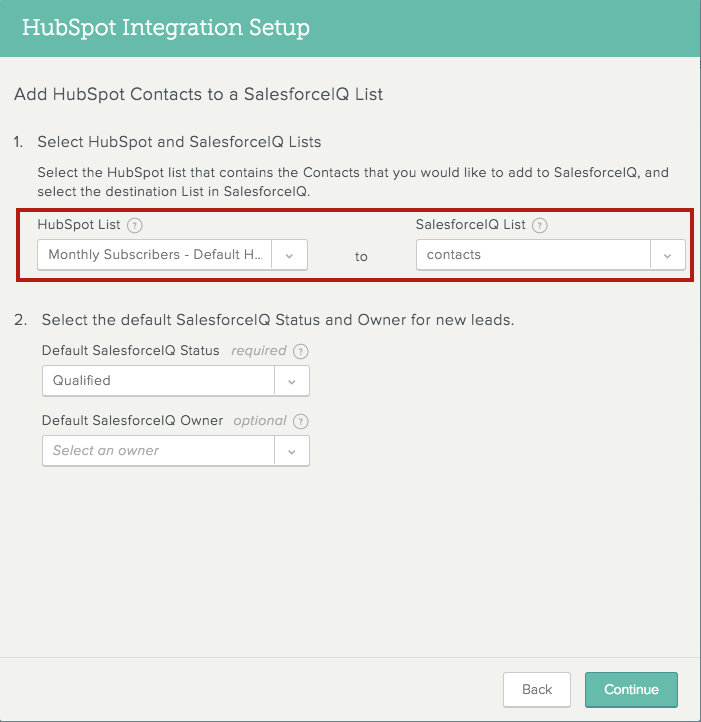 With just a few simple steps, you can automatically add Contacts and related information from HubSpot to any Contact-based SalesforceIQ List. When you connect a HubSpot List to a SalesforceIQ List, any new Contacts sync automatically to SalesforceIQ approximately every hour. If the HubSpot Contact already exists on the SalesforceIQ List, any new or different information in HubSpot is updated in SalesforceIQ. This ensures that you have the latest and greatest lead information at your fingertips, while keeping your SalesforceIQ List clean without any duplicates. Using HubSpot Smart Lists enables you to easily automate the process of selecting and syncing newly qualified leads into SalesforceIQ. For the destination, you can choose from all Contact-based Lists in SalesforceIQ. 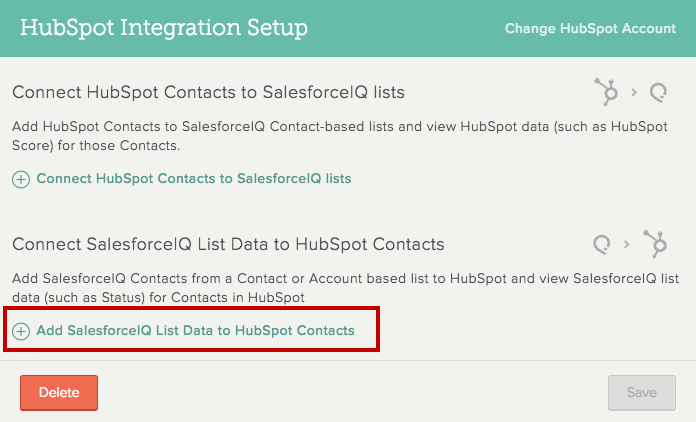 Because HubSpot is entirely Contact-based, the integration process creates new entries in your SalesforceIQ Lists based on Contacts. For example, add your leads from HubSpot to a leads List in SalesforceIQ so that you can use SalesforceIQ as your primary working List for your sales qualification process. Tip: Use our easy conversion flow to connect any Contact-based List to an Account-based List so you can easily move leads to opportunities once they become sales-qualified. 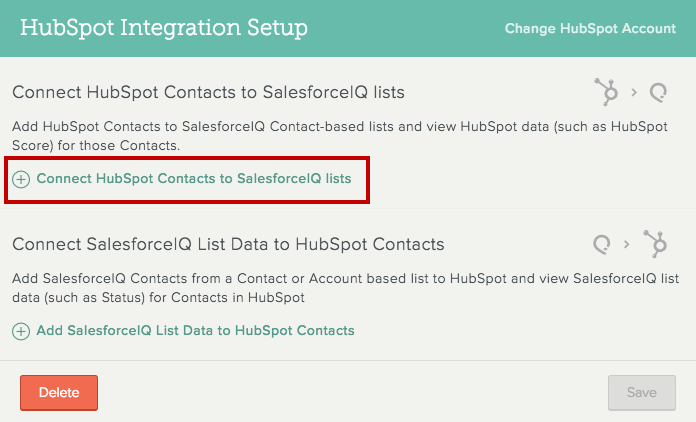 Click Connect HubSpot Contacts to SalesforceIQ lists. 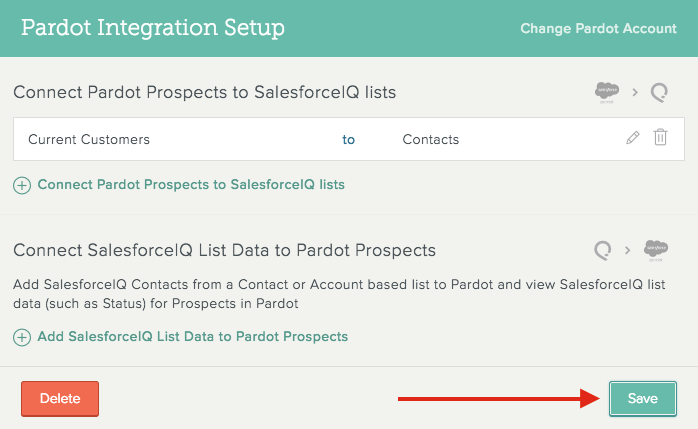 Under HubSpot List, select the List that contains the Contacts you want to add to SalesforceIQ. Under SalesforceIQ List, select the List to which you want to add the Contacts. Select an existing default status for the added Contacts. Click Create new status to enter a new default status for the Contacts. (Optional) Under Default SalesforceIQ Owner, select an owner for the added contacts. You can automatically add SalesforceIQ data from your critical Lists to your HubSpot Contact database. 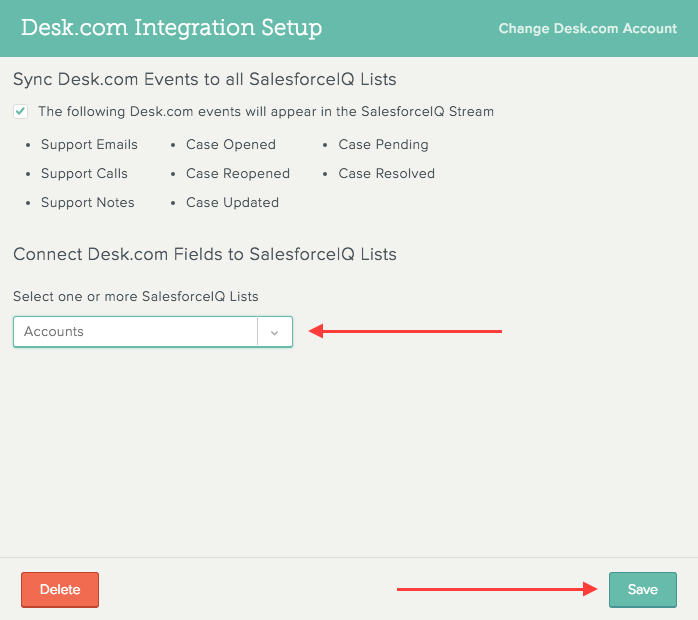 When you connect a SalesforceIQ List to HubSpot, any relevant information from that List is added to the Contact record for any point of Contact. A new property group called “SalesforceIQ Information" is created that updates automatically approximately every hour. For points of Contact that don't already exist in HubSpot, you have the option to create new Contact records in HubSpot. 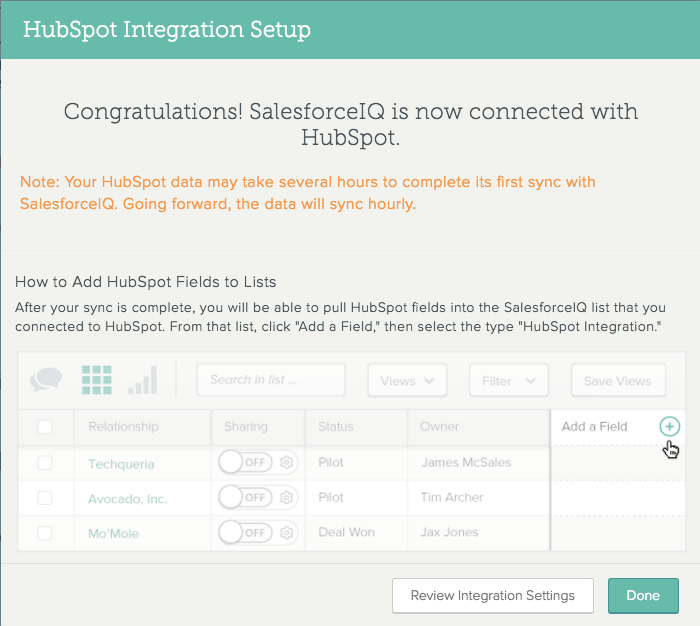 Follow the steps in Getting Started to set up your HubSpot integration. 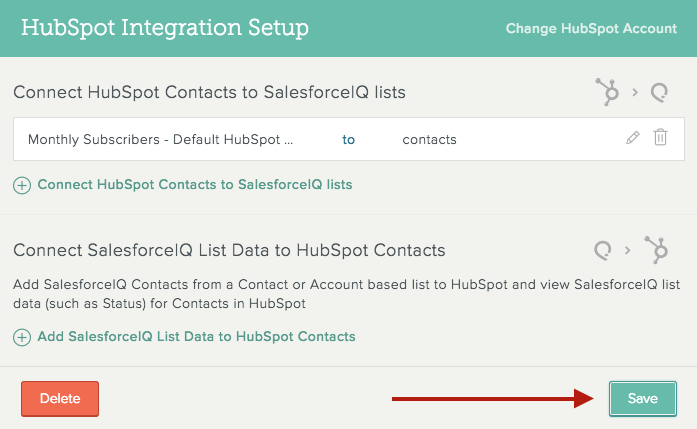 Click Add SalesforceIQ List Data to HubSpot Contacts. Under Select a SalesforceIQ list, select the SalesforceIQ List you want to integrate with your HubSpot list. To create new Contact records in HubSpot, check the Add new Contacts to HubSpot box. 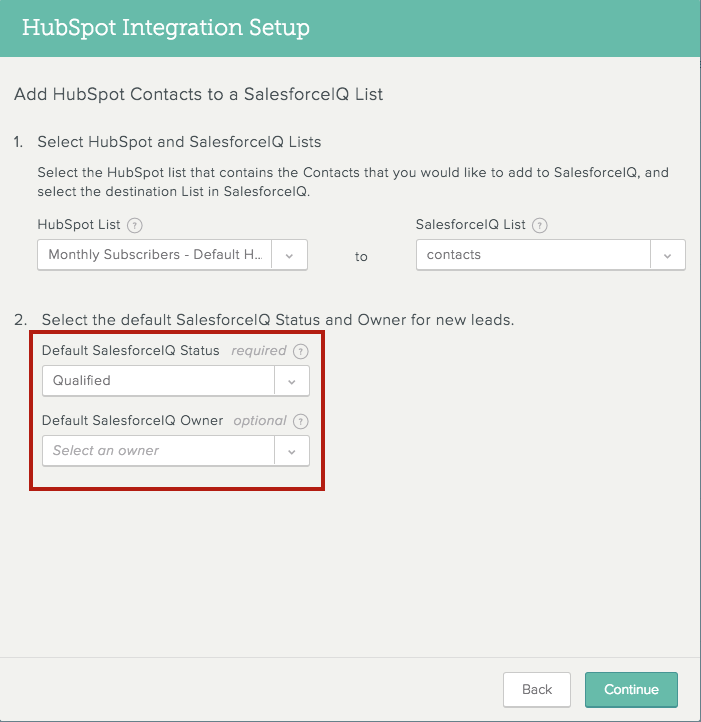 If you select this option: If a Contact exists in SalesforceIQ that doesn't exist in HubSpot, the integration process creates a new Contact in HubSpot. 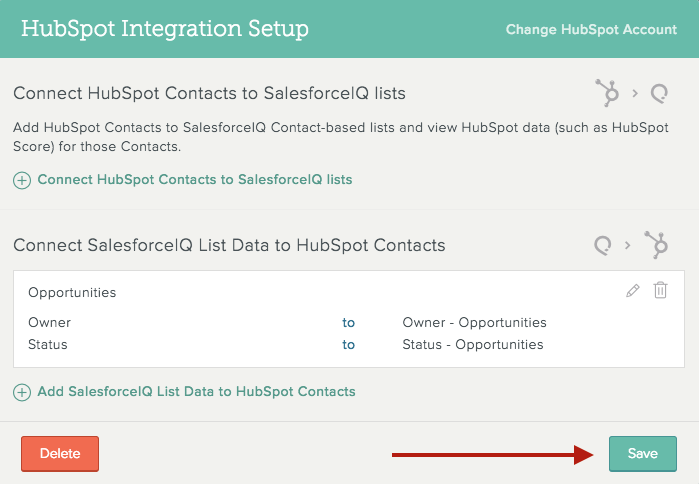 If you don't select this option: The integration process updates any existing Contacts in HubSpot with the new information in SalesforceIQ, but doesn't create any new Contacts in HubSpot. Under SalesforceIQ List Fields, select the SalesforceIQ fields that you want to add to your HubSpot Contacts. For each field you select, under HubSpot Custom Fields, the system generates a name for the field as it will appear in HubSpot. To add another field from the selected List, click Add a field. To add a field that appears in another SalesforceIQ List, click Add fields from another list. Review your connection information and click Save. Note: Your HubSpot data may take several hours to complete its first sync with SalesforceIQ. Going forward, the data will sync hourly. Only one sync request can be made per hour. If two or more sync requests are made within an hour, the requests are placed into a queue. Each hour, the next request in queue syncs. Add or edit SalesforceIQ and HubSpot connections. 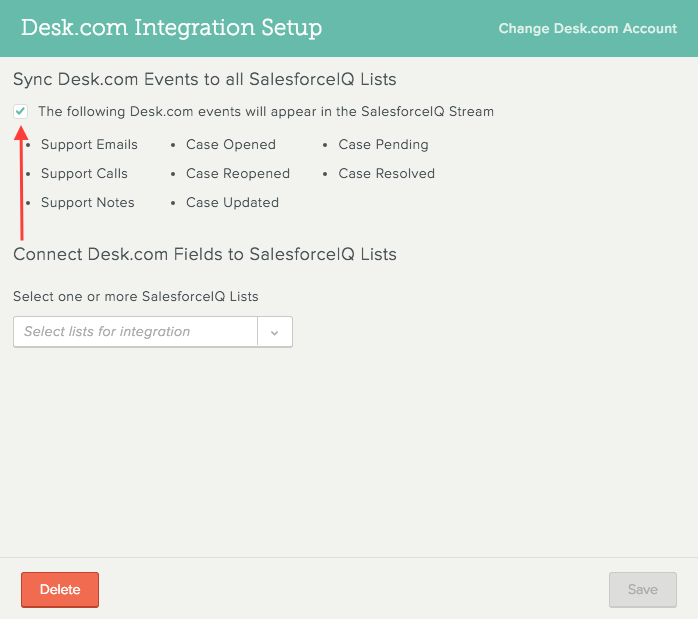 View a HubSpot Smart List in SalesforceIQ to see the effects of your integration. In the HubSpot section under Add a field, select any HubSpot property and view all the information you need about the leads you are adding to SalesforceIQ—for example, lead score, lead source, emails opened, or emails closed. To add a HubSpot field, click Add a field. Your HubSpot fields now appear in the list of options. In HubSpot, view any Contact to see all your rich SalesforceIQ data displayed right there. For example, click View all Properties, and then click SalesforceIQ Information to see all the new targeting information you have at your fingertips. Note: You can click Edit or Delete to modify a SalesforceIQ entry in HubSpot. This does not edit or delete the corresponding data in SalesforceIQ. Connecting SalesforceIQ to Pardot takes just minutes. You can either add prospects from Pardot into SalesforceIQ, pull information from SalesforceIQ into Pardot, or do both! This connection lets you get new marketing prospects into your sales team's hands with no manual effort. By pulling Pardot information into your SalesforceIQ list, you'll arm your sales teams to qualify prospects faster and smarter than ever before. 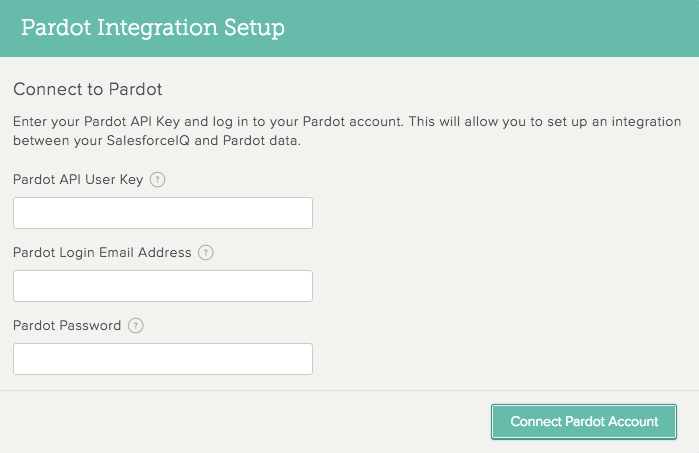 Under Create Direct Integration, click Pardot. On the information screen that appears click Next. 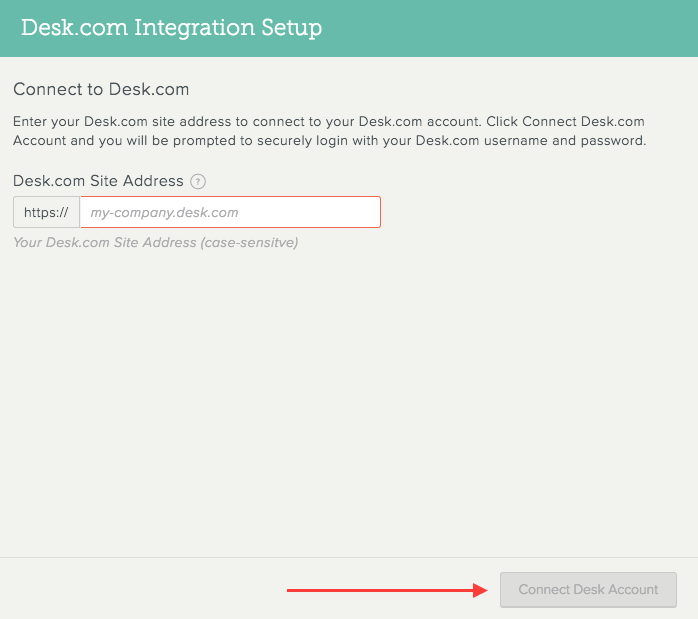 Enter your Pardot login information and click Connect Pardot Account. 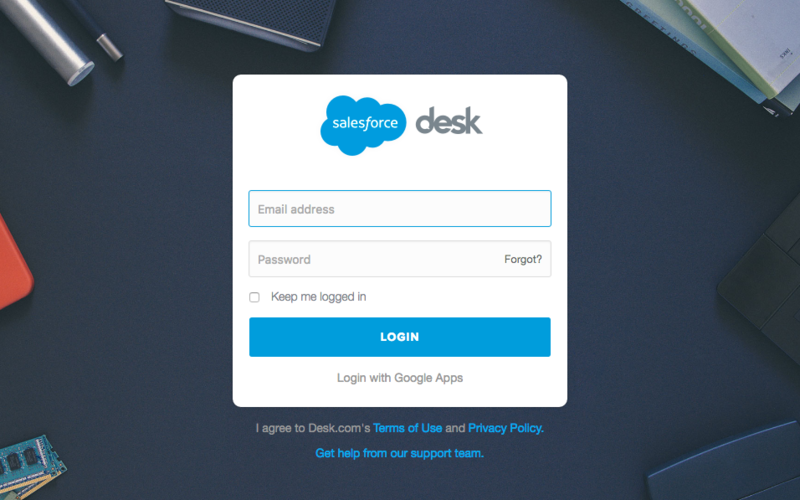 Note: To find your Pardot API User Key, log in to Pardot, click your Pardot login email address in the upper-right corner of the home screen, and click Settings. Your API User Key appears under My User Information. 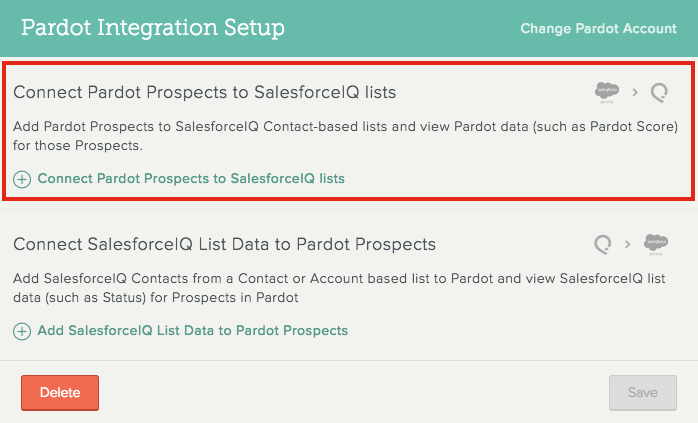 With just a few simple steps, you can automatically add prospects and related information from Pardot to any Contact-based SalesforceIQ List. When you connect a Pardot list to a SalesforceIQ List, any new prospects sync automatically to SalesforceIQ approximately every hour. If the Pardot prospect already exists on the SalesforceIQ List, any new information in Pardot is updated in SalesforceIQ. This ensures that you have the latest and greatest lead information at your fingertips, while keeping your SalesforceIQ List clean without any duplicates. Using Pardot lists enables you to easily automate the process of selecting and syncing newly qualified leads into SalesforceIQ. For the destination, you can choose from all Contact-based Lists in SalesforceIQ. 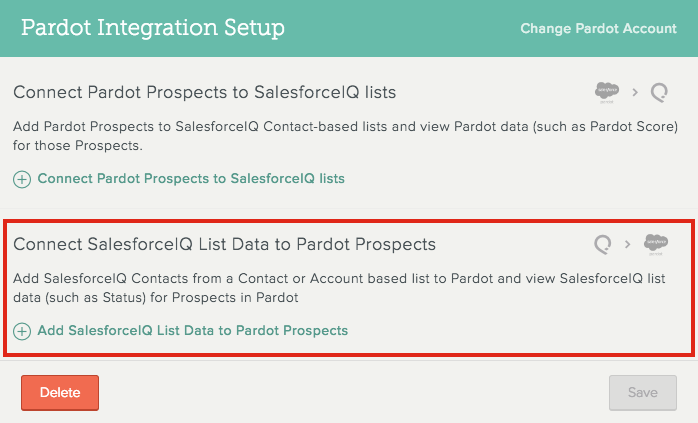 Because Pardot is entirely Contact-based, the integration process creates new List entries in SalesforceIQ based on Contacts. For example, add your prospects from Pardot to a leads List in SalesforceIQ so that you can use SalesforceIQ as your primary working List for your sales qualification process. Tip: Use our easy conversion flow to connect any Contact-based List to an Account-based List so you can easily move prospects to opportunities once they become sales-qualified. 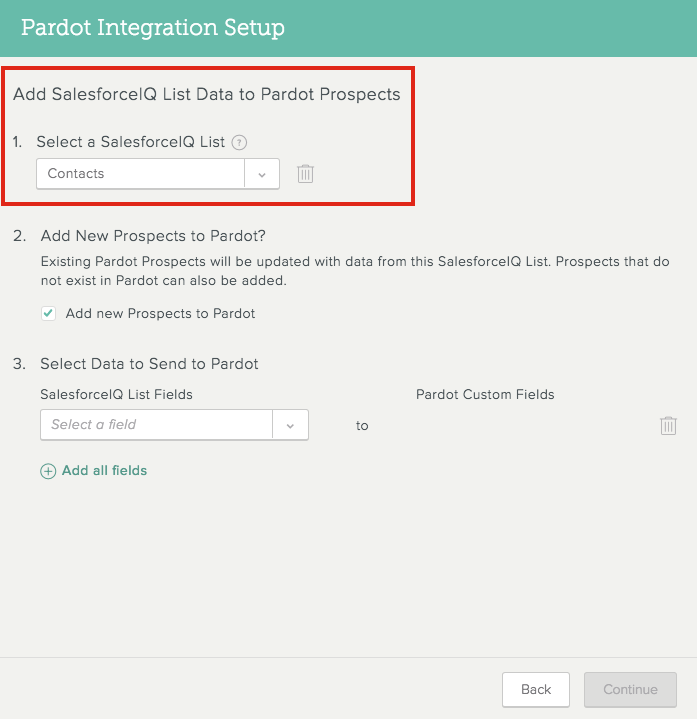 Click Connect Pardot Prospects to SalesforceIQ lists. Under Pardot List, select the List that contains the prospects you want to add to SalesforceIQ. Under SalesforceIQ List, select the List to which you want to add the prospects. Select an existing default status for the added prospects. Click Create new status to enter a new default status for the prospects. (Optional) Under Default SalesforceIQ Owner, select an owner for the added prospects. You can automatically add SalesforceIQ data from your critical Lists to your Pardot prospects database. 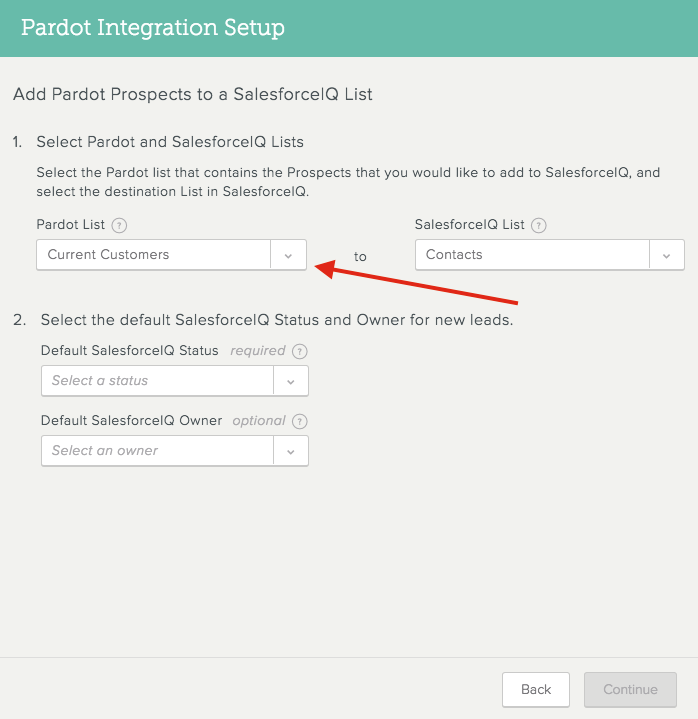 When you connect a SalesforceIQ List to Pardot, any information that you select from that List is added to as a custom field in the Pardot List for any point of Contact. This information updates automatically approximately every hour. For points of Contact that don't already exist in Pardot, you have the option to create new Contact records in Pardot. 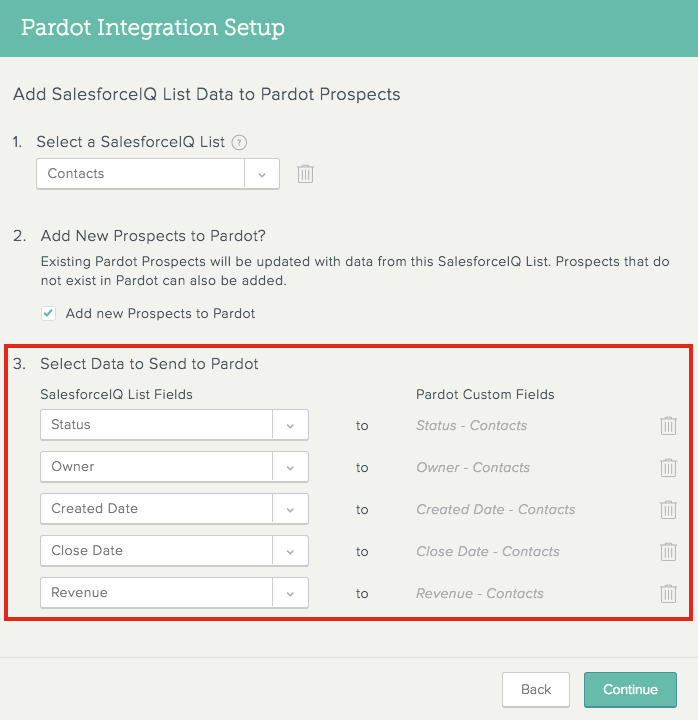 Click Add SalesforceIQ List Data to Pardot Prospects. 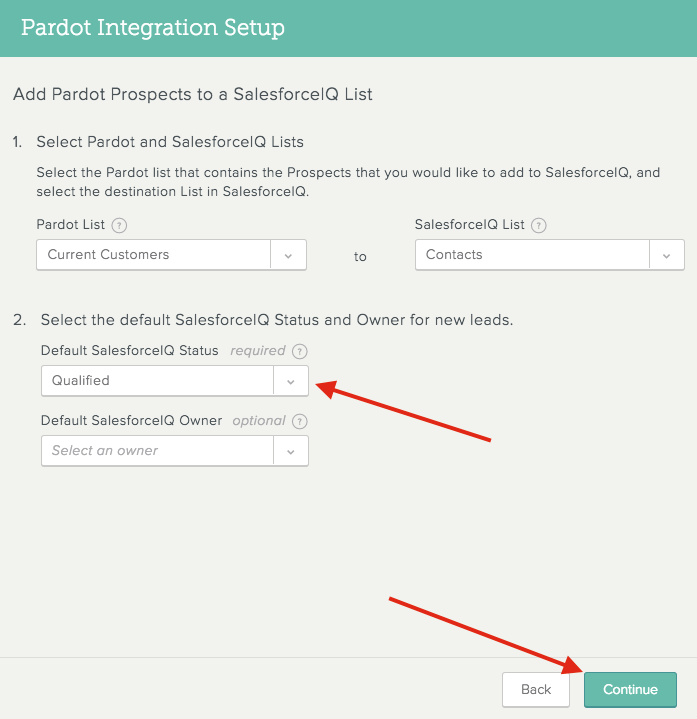 Under Select a SalesforceIQ List, select the List that contains the information you want to add to Pardot. To create new Contact records in Pardot, check the Add new Prospects to Pardot box. 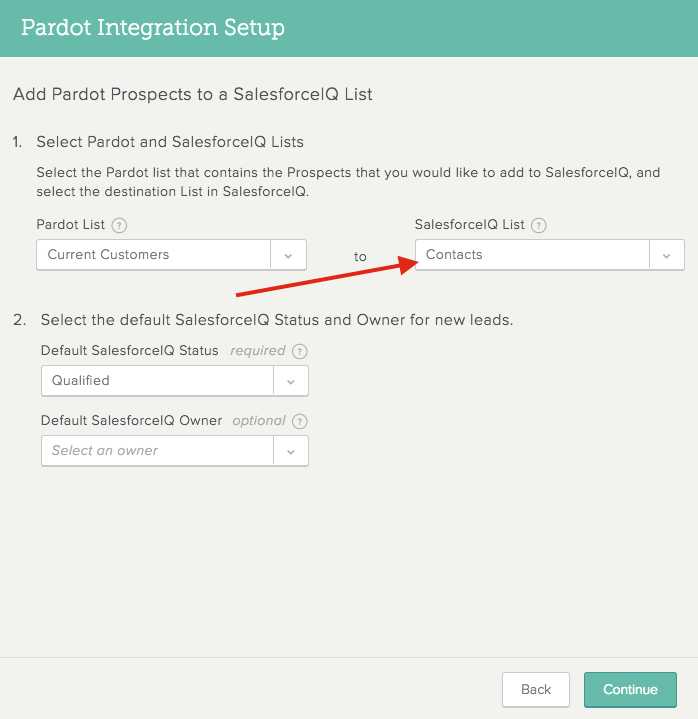 If you select this option: If a Contact exists in SalesforceIQ that doesn't exist in Pardot, the integration process creates a new prospect in Pardot. 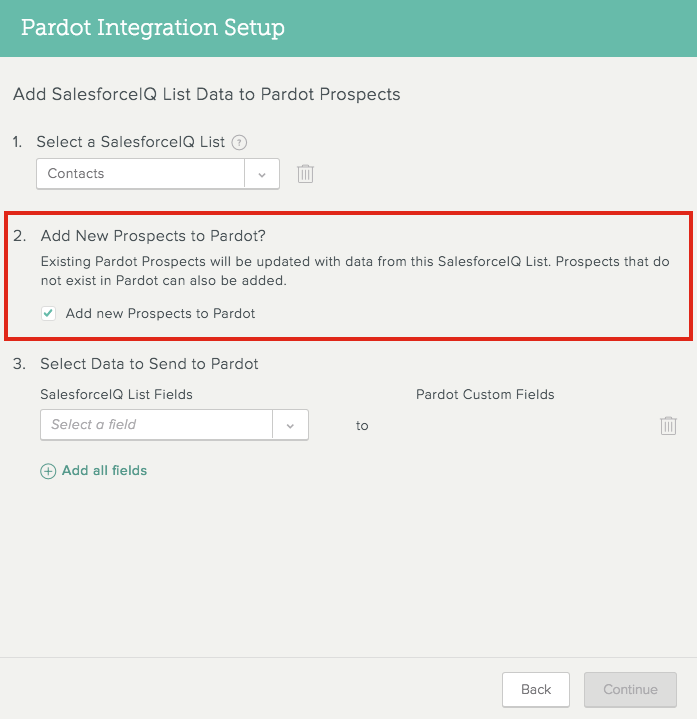 If you don't select this option: The integration process updates any existing prospects in Pardot with the new information in SalesforceIQ, but doesn't create any new prospects in Pardot. Under SalesforceIQ List Fields, select the SalesforceIQ fields that you want to add to your Pardot prospects. For each field you select, under Pardot Custom Fields, the system generates a name for the field as it will appear in Pardot. Note: Your Pardot data may take several hours to complete its first sync with SalesforceIQ. Going forward, the data will sync hourly. Only one sync request can be made per hour. Add or edit SalesforceIQ and Pardot connections. 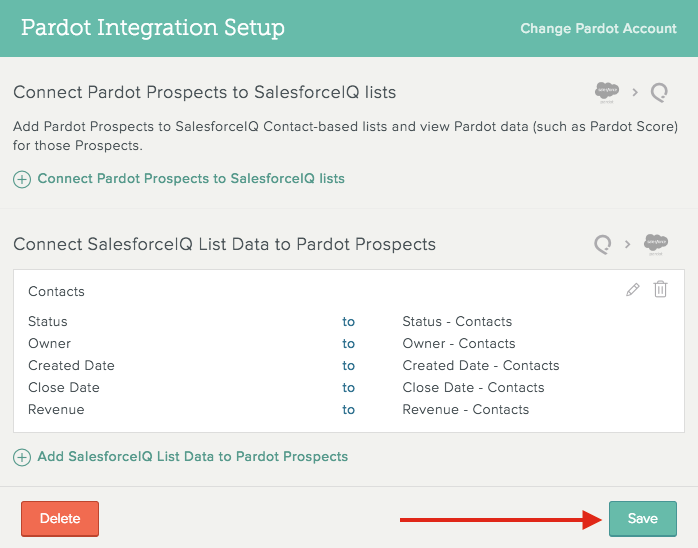 View a Pardot List in SalesforceIQ to see the effects of your integration. In the SalesforceIQ Add a field section under Pardot, select any Pardot property you have on your Pardot List and view all the information you need about the prospects you are adding to SalesforceIQ—for example, lead score, lead source, emails opened, or emails closed. To add a Pardot field, click Add a field. Your Pardot fields now appear in the list of options. In Pardot, view any prospect to see all your rich SalesforceIQ data displayed as a custom field in the Pardot List. Note: You can click Edit or Delete to modify a SalesforceIQ entry in Pardot. This does not edit or delete the corresponding data in SalesforceIQ. 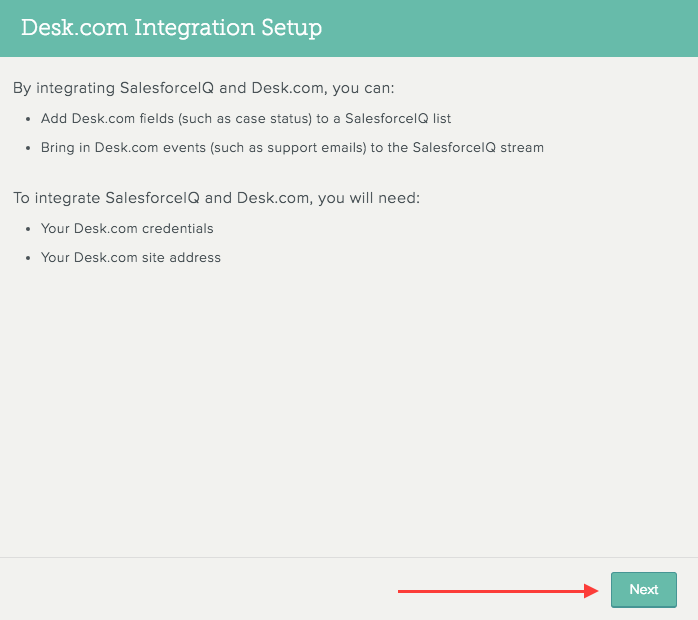 To view the status of your integration in SalesforceIQ, click at the top of the screen, select Settings, and then select Integrations. Your integration status appears under your API Key. 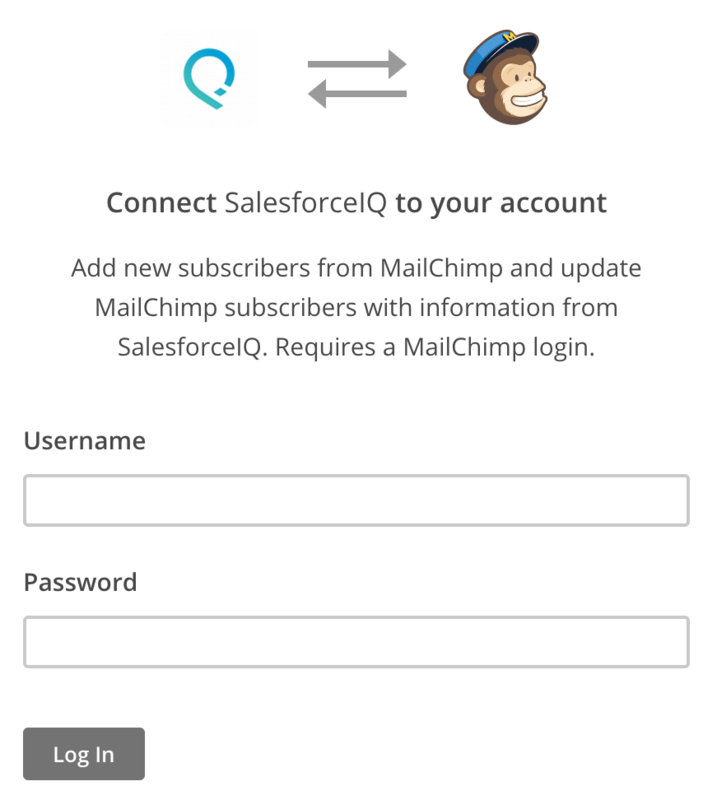 Connecting SalesforceIQ to MailChimp takes just minutes. 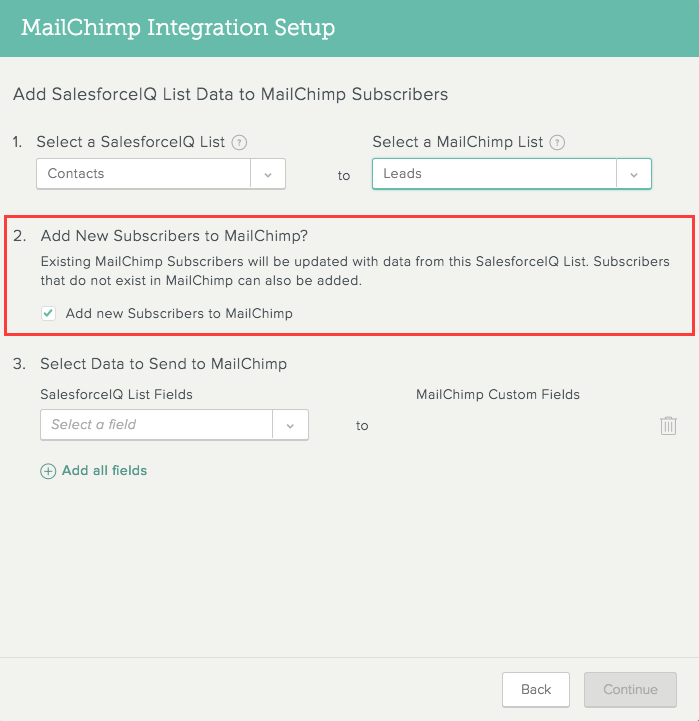 You can either add subscribers from MailChimp into SalesforceIQ, pull information from SalesforceIQ into MailChimp, or do both! This connection lets you get new marketing subscribers into your sales team's hands with no manual effort. By pulling MailChimp information into your SalesforceIQ list, you'll arm your sales teams to qualify subscribers faster and smarter than ever before. 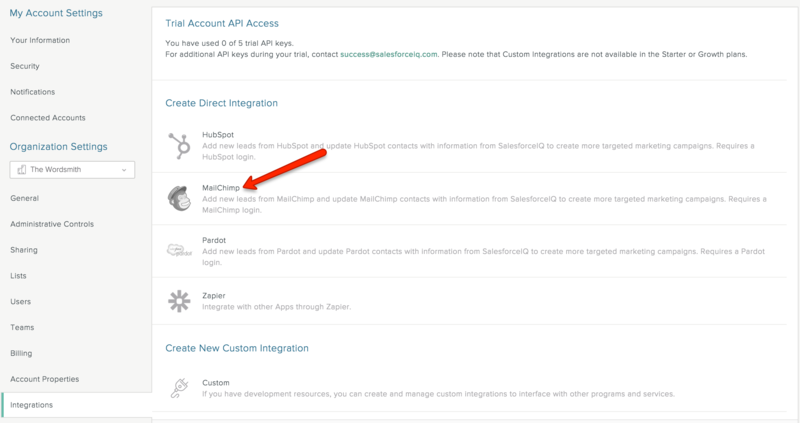 Integration with MailChimp works with Contact-based Lists only. Outgoing emails sent from MailChimp aren't logged in the SalesforceIQ Stream. However, replies to those emails do appear in the Stream as long as the sender is a collaborator on that List. 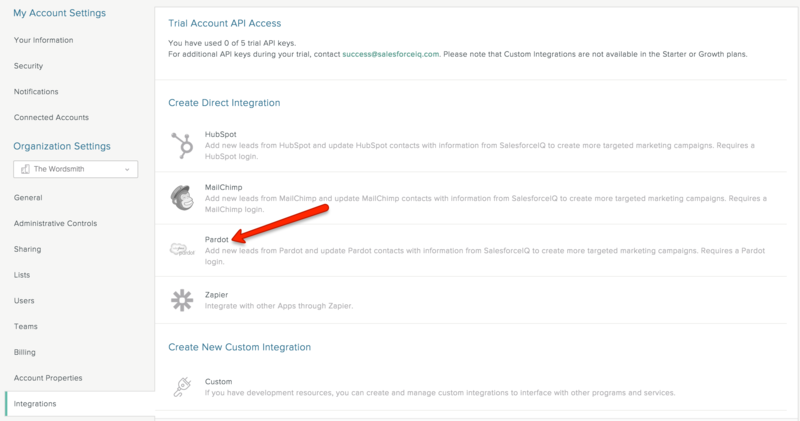 Under Create Direct Integration, click MailChimp. On the information screen that appears, click Connect MailChimp Account. Enter your MailChimp login information and click Log In. With just a few simple steps, you can automatically add subscribers and related information from MailChimp to any Contact-based SalesforceIQ List. When you connect a MailChimp List to a SalesforceIQ List, any new subscribers sync automatically to SalesforceIQ approximately every hour. If the MailChimp subscriber already exists on the SalesforceIQ List, any new information in MailChimp is updated in SalesforceIQ. This ensures that you have the latest and greatest lead information at your fingertips, while keeping your SalesforceIQ List clean without any duplicates. Using MailChimp lists enables you to easily automate the process of selecting and syncing newly qualified leads into SalesforceIQ. For the destination, you can choose from all Contact-based Lists in SalesforceIQ. Since MailChimp is entirely Contact-based, the integration process creates new List entries in SalesforceIQ based on Contacts. For example, add your subscribers from MailChimp to a leads List in SalesforceIQ so that you can use SalesforceIQ as your primary working List for your sales qualification process. Tip: Use our easy conversion flow to connect any Contact-based List to Account-based so you can easily move subscribers to opportunities once they become sales-qualified. 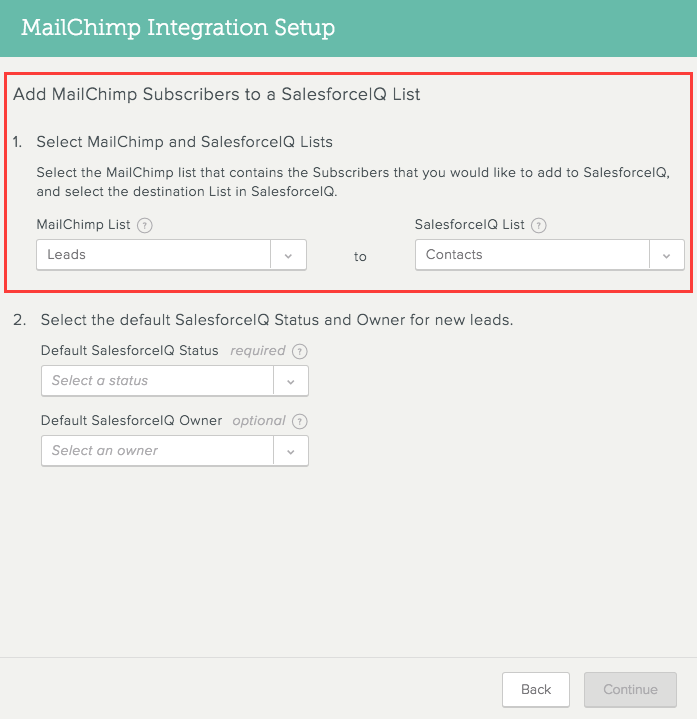 Click Connect MailChimp Subscribers to SalesforceIQ lists. 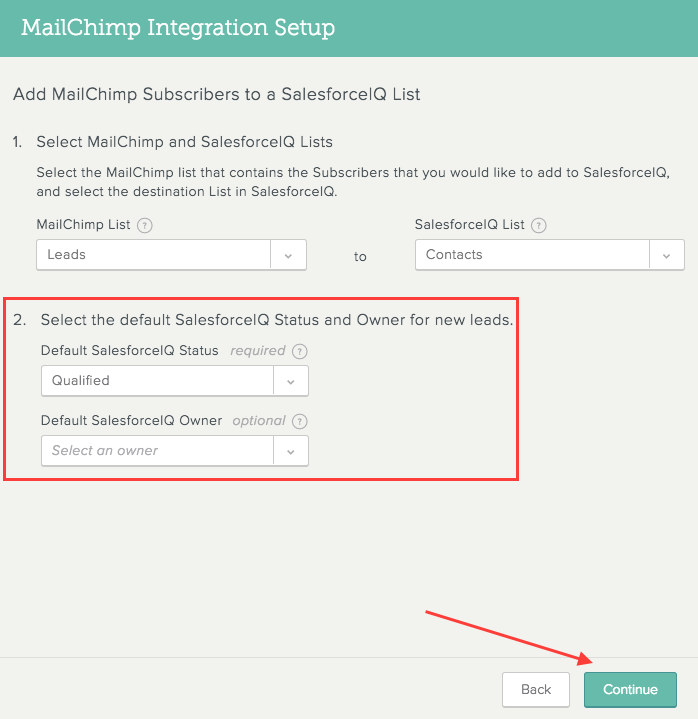 Under MailChimp List, select the List that contains the subscribers you want to add to SalesforceIQ. Under SalesforceIQ List, select the List to which you want to add the subscribers. Select an existing default status for the added subscribers. Click Create new status to enter a new default status for the subscribers. (Optional) Under Default SalesforceIQ Owner, select an owner for the added subscribers. You can automatically add SalesforceIQ data from your critical Lists to your MailChimp subscriber database. 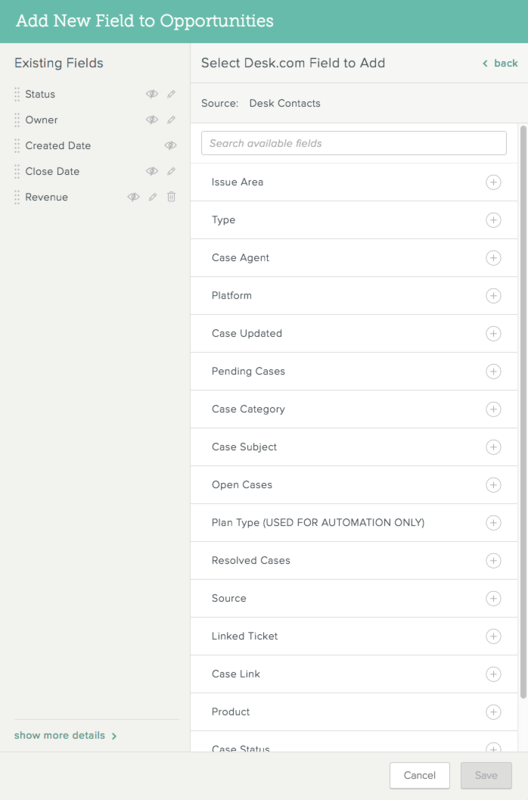 When you connect a SalesforceIQ List to MailChimp, any information that you select from that List is added to as a custom field in MailChimp for any point of Contact. This information updates automatically approximately every hour. For points of Contact that don't already exist in MailChimp, you have the option to create new Contact records in MailChimp. 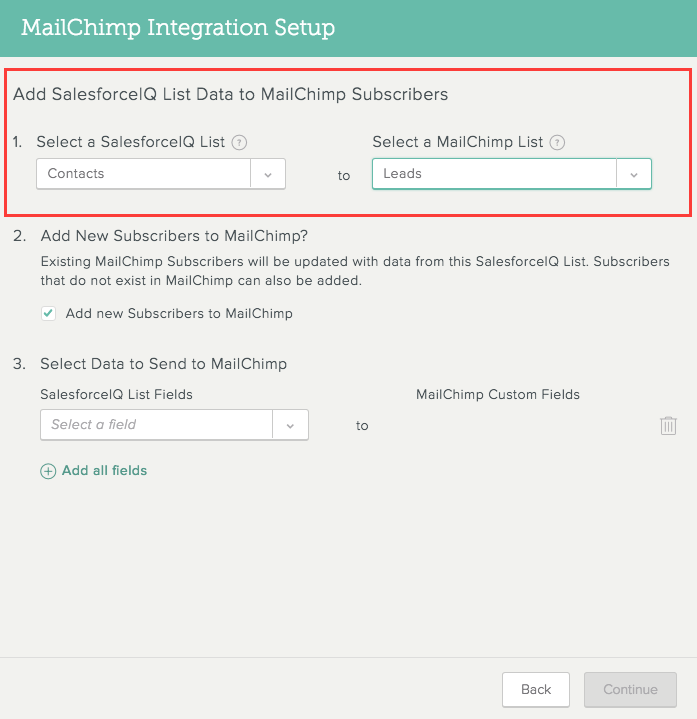 Under Connect SalesforceIQ List Data to MailChimp Subscribers, click Add SalesforceIQ List Data to MailChimp Subscribers. Under Select a SalesforceIQ List, select the List that contains the information you want to add to MailChimp. To create new subscriber records in MailChimp, check the Add new Subscribers to MailChimp box. 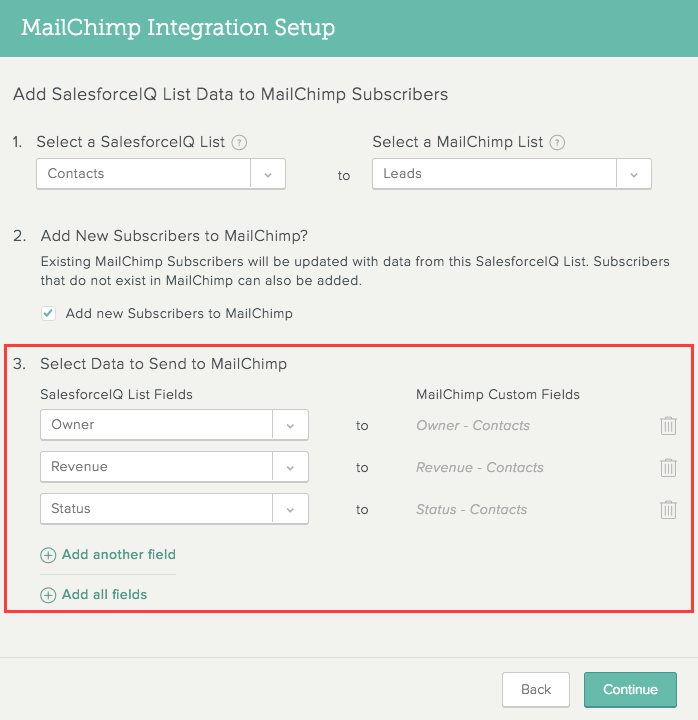 If you select this option—If a Contact exists in SalesforceIQ that doesn't exist in MailChimp, the integration process creates a new subscriber in MailChimp. 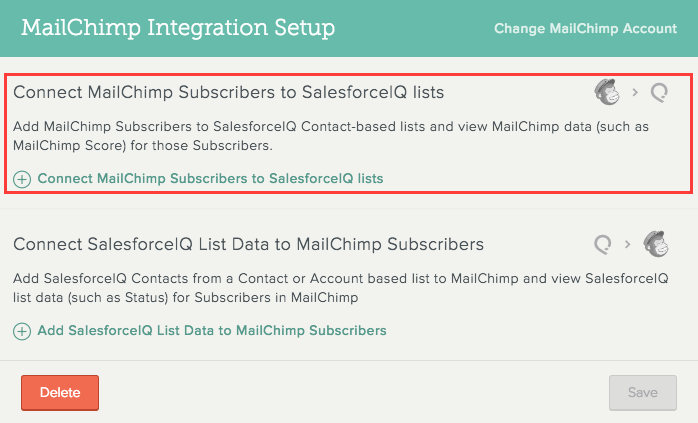 If you don't select this option—The integration process updates any existing subscribers in MailChimp with the new information in SalesforceIQ, but doesn't create any new subscribers in MailChimp. Under SalesforceIQ List Fields, select the SalesforceIQ fields that you want to add to your MailChimp subscribers. 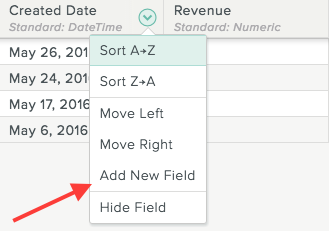 For each field you select, under MailChimp Custom Fields, the system generates a name for the field as it will appear in MailChimp. To add another field from the selected list, click Add another field. To add all the fields from the selected List, click Add all fields. 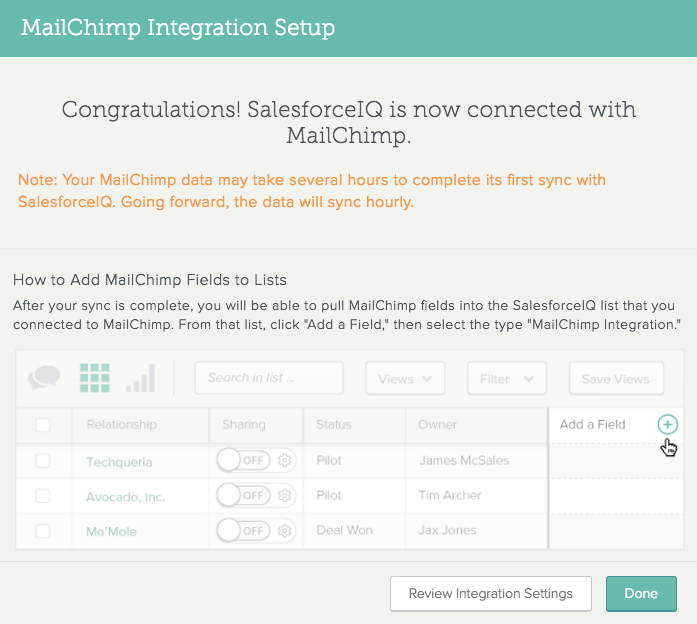 Note: Your MailChimp data may take several hours to complete its first sync with SalesforceIQ. Going forward, the data will sync hourly. Only one sync request can be made per hour. The integration is limited to syncing a total of 30 fields (between SalesforceIQ and MailChimp and/or between MailChimp and SalesforceIQ). If you exceed this limit, the integration will be automatically paused. Add or edit SalesforceIQ and MailChimp connections. 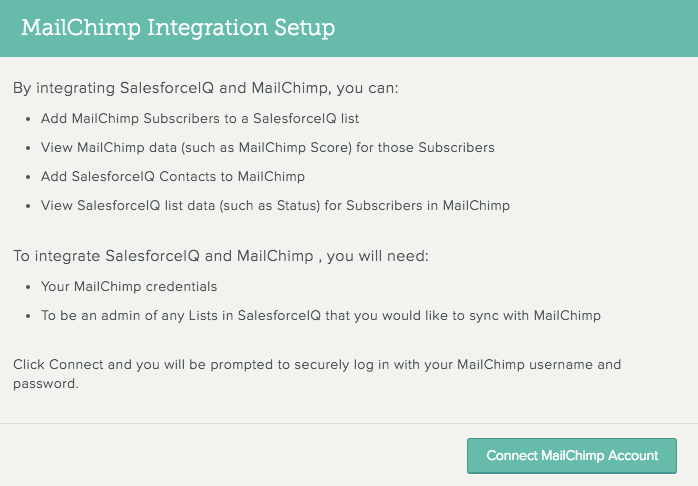 View a MailChimp list in SalesforceIQ to see the effects of your integration. In the SalesforceIQ Add a field section under MailChimp, select any MailChimp property you have on your MailChimp list and view all the information you need about the subscribers you are adding to SalesforceIQ—for example, lead score, lead source, emails opened, or emails closed. 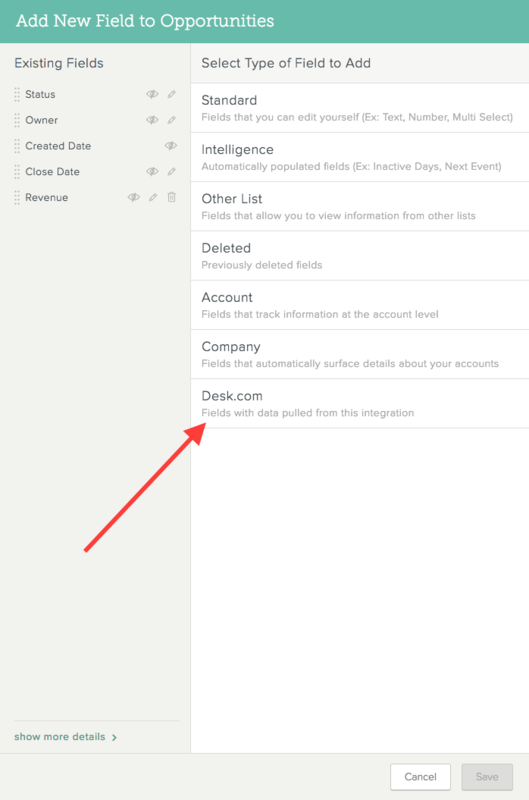 To add a MailChimp field, click Add a field. Your MailChimp fields now appear in the list of options. In MailChimp, view any subscriber to see all your rich SalesforceIQ data displayed as a custom field in the MailChimp List. 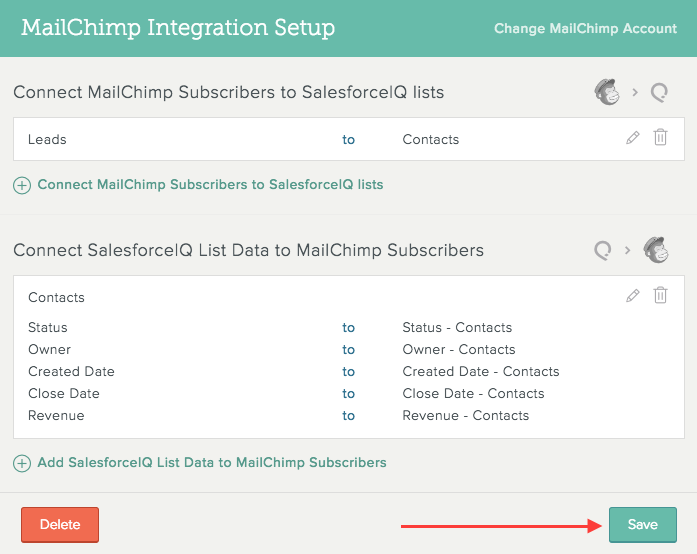 Note: You can click Edit or Delete to modify a SalesforceIQ entry in MailChimp. This does not edit or delete the corresponding data in SalesforceIQ.